Following knee surgery last month, Hakuho seems to be a long shot to compete in November’s Kyushu Grand Tournament. Practicing for the first time since surgery on Wednesday, the Yokozuna was unable to put full pressure on a his right knee, which underwent endoscopic surgery on October 18th, to remove a bone spur. 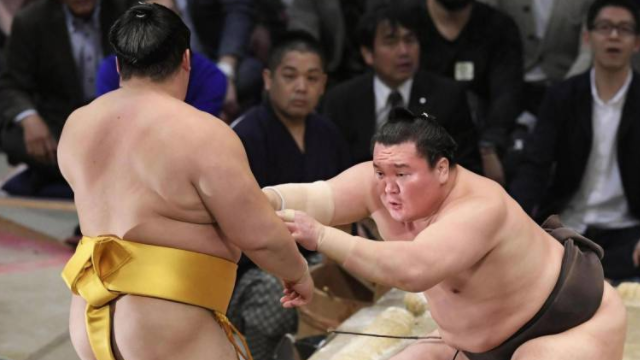 In September, Hakuho extended his record for career grand tournament championships to 41 with a perfect 15-0 record, yet opted for surgery after the condition of his knee worsened. Wearing a knee support and bandage on his ankle following a procedure to remove loose cartilage, Hakuho focused on moving smoothly on his right leg. He did not put any real pressure on the joint, however, saying, “I’d like to do that next week. The ankle hurt today.